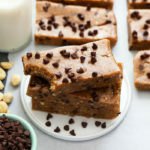 With just 4 real-food ingredients, you can make these delicious homemade Peanut Butter Chocolate Chip Larabars. 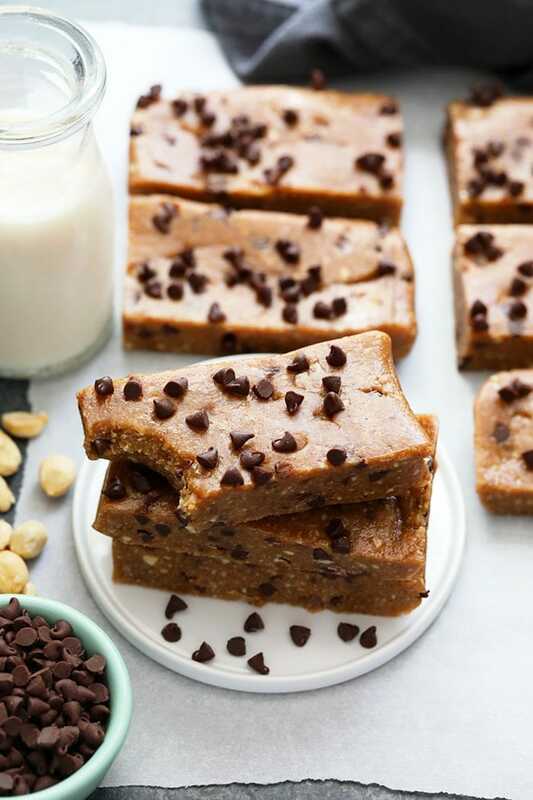 This homemade Larabar recipe is vegan & gluten-free and such a perfect on-the-go snack for the kiddos or…you! August is always a nostalgic time of year for me. I still have nightmares that I didn’t actually graduate college. It’s this dumb reoccurring dream that happens every so often where I signed up for 4 classes and ended up”forgetting” about one of the classes and failed it. It wasn’t just any class, it was a mandatory class needed to graduate. I BARELY think about college, so it’s always weird when this dream pops into my head. Anyways, August made me think of this! I can’t believe August is right around the corner. Targets worldwide have already started their back-to-school campaign and it makes me freak out inside. Funny thing is, my 10-year high school reunion is this year meaning that 10-years ago this August, I started college! WOAH. 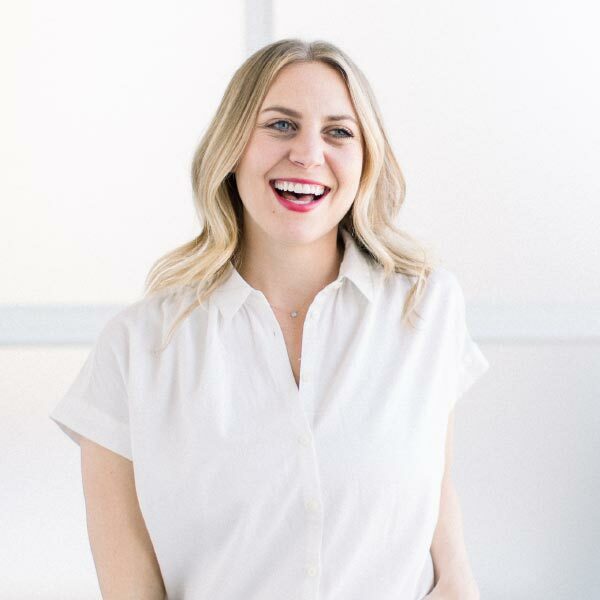 8 years ago this November I started Fit Foodie Finds. Man, I’m old balls. 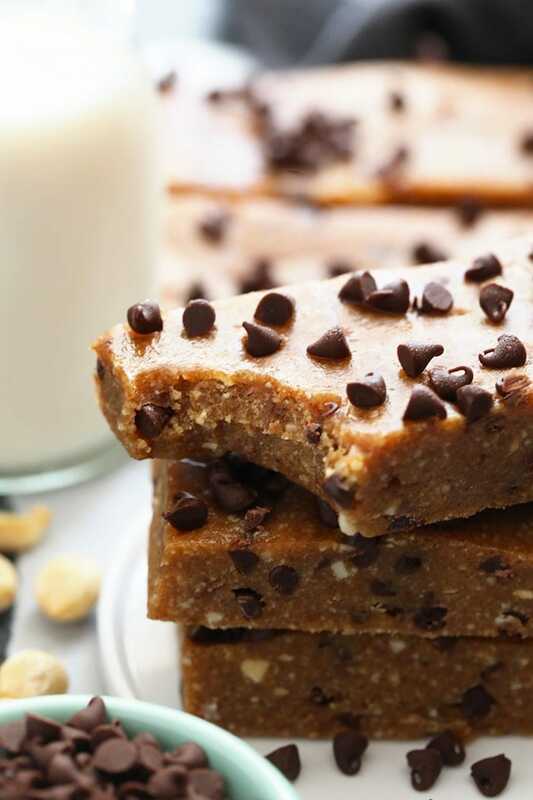 In honor of school starting up, we thought we’d create a delicious and easy homemade Larabar recipe. Why? Because I was OBSESSED with Larabars in college. I bought them every single week because I love how minimal their ingredient lists are. Big fan of Larabars and I hope you are too! It’s obvious why we chose this flavor. Becuase peanut butter and chocolate chips make the world go round. So what do you need for these little ditties? 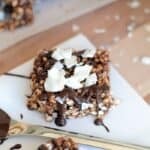 The key to this recipe is soft Medjool dates! Typically when you buy Medjool dates in the produce section, they are much fresher than the packaged section. The softer they are, the easier they are to pulverize in the food processor. One more cool thing about this recipe! 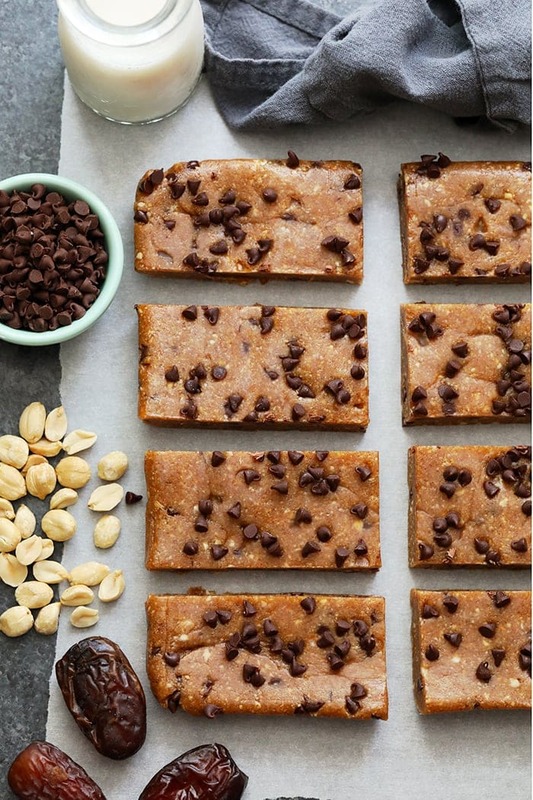 If you buy your ingredients in bulk, you can make these bars for less than $1 per bar. I call that a win. Most co-ops and health food stores like Whole Foods and Fresh Tyme have amazing bulk sections. For sure check them out! You’ll be plesantly surprised. 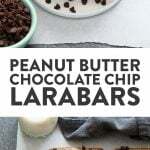 With just 4 real-food ingredients, you can make these delicious Copycat Peanut Butter Chocolate Chip Larabars. 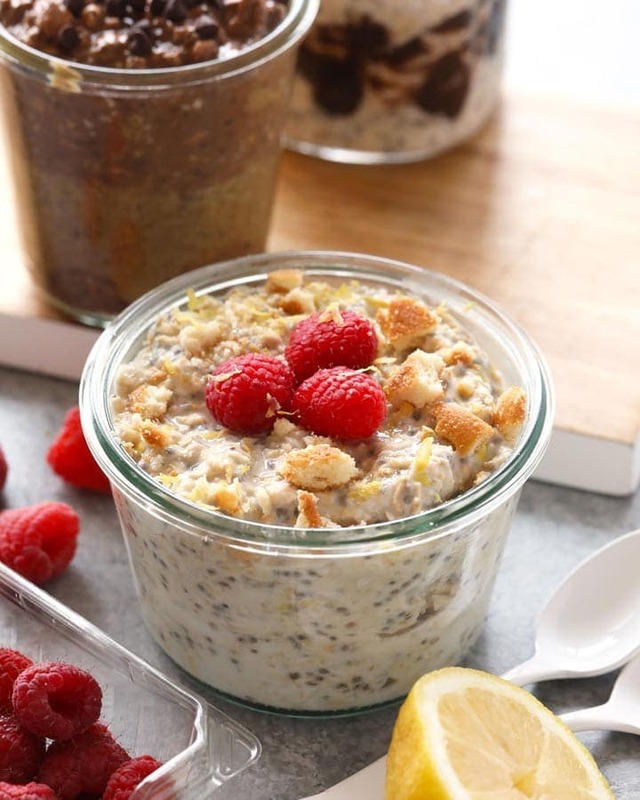 This Larabar recipe is vegan, gluten-free, and paleo-friendly! First, line a square cake pan with parchment paper. Set aside. Next, pit 20 dates. Then, add to food processor. 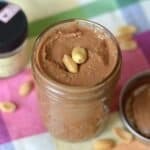 Add peanuts and salt and blend on high until your dough has formed. You may need to stop a few times to scrape the sides. Your dough should be sticky, yet not too wet. Transfer your food processor into the fridge for 5 minutes to cool just a tad. You want to do this so the chocolate chips don’t melt! 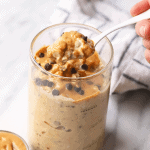 Once slightly chilled, add the chocolate chips and give it one last whirl to combine. 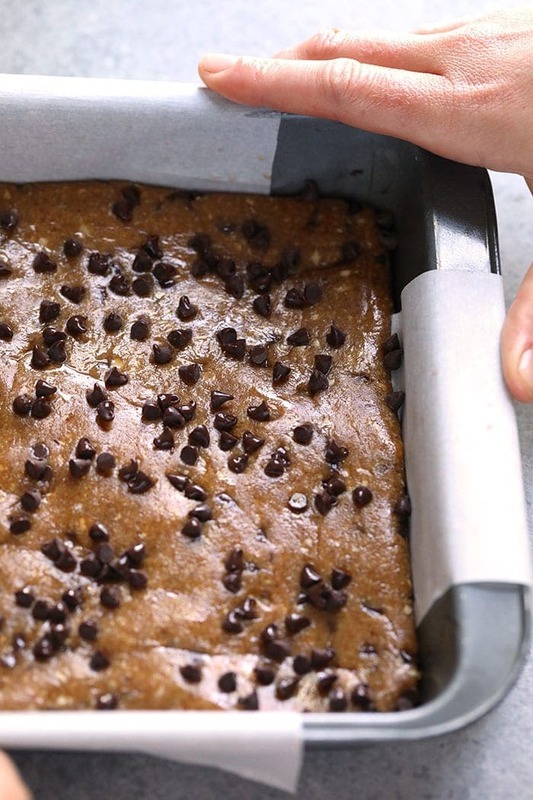 Transfer dough into cake pan and use your hands to spread out evenly. If you spray your hands with cooking spray, there will be less sticking. Place cake pan in the freezer for 1-2 hours. Remove from freezer and let sit for 5 minutes until you can wiggle the bars out of the cake pan. Use a sharp knife to cut into 8 bars. 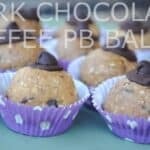 Make sure you are using soft dates for this recipe. If your dates are older/harder, you will likely need to add a few teaspoons of water. Storage: Store in the refrigerator for up to 2 weeks or in the freezer for up to 3 months. If you’re eating these bars as more of a snack, feel free to cut the serving size in half to make 16 total bars!